The real you is existential. The false self is an illusion. The vast majority of people on this planet are a figment of others imagination as well as their own. Noticing what the thoughts passing by in your head will bring awareness to this simple fact. Rather than paying attention, one winds up paying an exorbitant price going along with the delusional thoughts that arise from judgments. When I say you, I mean the authentic you. When someone asks who you are, one typically answers with their race, gender, gender stereotypes, sexual orientation, religion, political beliefs, class ranking, clothes, lifestyle, and an endless list of things they have or do. These have no bearing whatsoever on who and what you are in Being. Nothing is required for your Being or your self-worth. If one is going to obsessively think, at least give yourself the courtesy of obsessing on some of my questions. At least there will be a payoff in the long run or if you get tuned in enough, you might have a significant breakthrough. The many tend to believe they exist, but what is this "they"? Who and what is existing? Being? Thinking is always optional and tends to get in the way most of the time. A nice distraction if one gets off on pain and suffering and delusional meanderings. You don't exist when you are worried about what others will think of you. What does it matter if they judge your personas, masks, facades? Did it ever occur to you that those who are judging you are judging from behind their own personas, masks, and facades? Why would someone spend so much time worrying about what others think of them? Where is your own approval in that process and is the price of fitting in worth it? If you only knew the experience of Being, you would realize how cheap and worthless the personas, masks, and facades are. You don't exist when you are reacting to what others do or don't do. You don't exist when you are judging your self. The personas, masks, facades were created in the first place from self-judgments based on what others around you in your growing up years who judged your authentic self. In order to fit in and be "acceptable," we believed their judgments as truth, beginning the long downfall from our heavenly nature. How can you exist when you are believing others know who you are better than yourself? It's a tricky situation since the many truly believe they know themselves, while being completely unaware of their delusions. The many have come to "believe" that self-judgment is an important component of being who they are. Self-judgment is not required at all in Being. Self-acceptance is what is needed for Being. One might "think", "what the hell does that mean? How absurd! I know who I am!" But in truth, all you know is what you believe, which is what was taught to you. As the old saying goes, "When in Rome, do as the Romans do." And that is what the many did as children in order to survive and as adults the many still continue to perpetuate this sin. The only sin is self-hatred and self-loathing. How does one tell if they are not in self-love? By the existence of judgments. The many have no awareness of their judgments as they are not present, so how could they. Many truly believe this is ludicrous, but the lie must lie in order to protect the lie. That's what insanity does. It's like the dog chasing its tail. If one continues chasing the lie, then they cannot see the truth. This is why the many are rutted in obsessive thinking. One can be obsessed about their appearance, their retirement fund, their belongings, their health, their vocation. Perhaps if one were to obsess on self acceptance, one might stop chasing their tail. The psychology/psychiatry community would have you believe that obsessive/compulsive only exists in certain people. Not so, for in order to avoid the now, one has to past/future trip obsessively to compulsively avoid it. One has to really work at avoiding the truth. Why the need to avoid the now other than to live a lie. You are who you are and if you are harming no one, then why the need to lie, other than to fit into the insanity of those who also live the lie. The many have created this delusional story and would have you believe the fairy tale is priceless; its not at all. The payoff may be materialistic gain and approval, but at what cost to one's Being. The price is not a thought, its a feeling, and that is why the body is considered sinful, because it will always reveal the lies. No feelings, no awareness. Then one can just think to the Nth degree and chase their tails happily ever after, until something or someone comes along to upset the lie. You want to see what your inner mindscape is like, then look around you at the outer world; it is but a mere reflection of the collective delusion of unconscious creative making based on a program of dysfunctional beliefs. Waking up is similar to experiencing culture shock. One visits another culture and goes through an awakening of sorts. There are many different levels of being shocked, as that is what it is; a shock to one's rigidified ego. Each person experiences it differently. I mentioned the cultural shock wake up, as the jolt is very similar to waking up to the various levels of dysfunction; fear, guilt, shame, etc. One need not go to another country to experience this, as one can go to another neighborhood in a rich or poor area or ethnic area or where a minority of people exist. Don't just sit inside your car or stay on the bus; get out and walk around or ride your bike through the area, maybe even shop and dine there. Get the direct experience and you will realize what I am getting at here. One might think that is ridiculous, but its just your ego resisting the truth from being revealed. One cannot just open up and expect to see everything just as it is. What you believe reality to be is just that; beliefs. When you past/future trip, how can you experience the direct experience that is occurring in the now? The reason for past/future tripping in the first place is to avoid having to be in the now to experience the pain and suffering; your pain and suffering as well as others pain and suffering. There is a price to pay for the fantasy of security. The delusion prevents one from realizing the price paid for abandoning one's self-respect and is why living in the head is so pervasive in the world. Humanity has yet to experience the wonder of their potential. perhaps they get a glimpse of it in the very young, just before they begin to sacrifice them to the box of conformity. Waking up is not an end, but a new beginning on living authentically in alignment with one's spiritual self. Your getting caught up in the rat race is not your problem alone, and it even includes me from time to time. Waking up requires one to see things as they really are and it is painful and causes suffering. Once you get the fear out of the way, the reacting, the resistance, the avoidance, then one's authentic self begins to present itself and this is where the pain and suffering fall away. Stop reacting, stop resisting, stop avoiding, and one is on their way in the flow of life; the other option is a living hell. It should also be noted the thinking surrounding the reacting, resisting, avoiding would have one believe that to let go of the struggle would be death; maybe as a child it would have been, but as an adult it only serves to further imprison and cripple. The reality of pain and suffering is that one wakes up to their own pain and suffering they've been unconscious too, as well as the pain and suffering of everyone around them. This pain and suffering is the sum total of burying one's authentic self; ignoring one's authentic self; judging one's authentic self. If you want to be free of pain and suffering, then let go of all you do in turning away from your authentic self. People believe that giving up fitting in and having others approval is a horrible loss, but truth be told, giving up your authentic self is far far worse, for you have sacrificed your own spiritual self for the sake of approval and material things of which have no value whatsoever. It's insanity to "think" others approval and material things have a greater value than your own authentic self. True delusion avoids the truth of Being. Is it really worth the price you pay to conform? 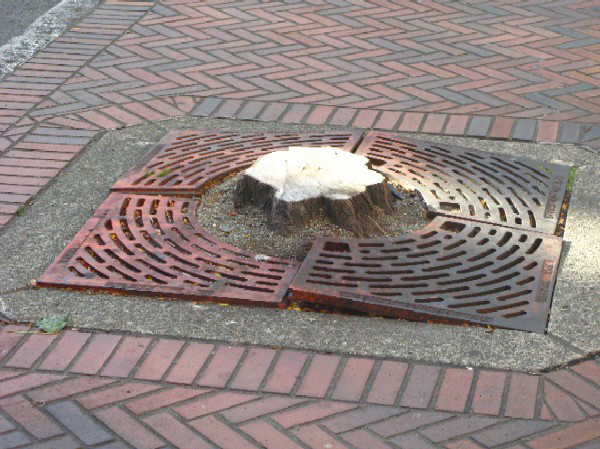 I took this picture in downtown Seattle because it reminded me of how each of us has our own tree of consciousness cut down. Notice the iron grates and bricks structured around the base of the tree, preventing any nutrients from being accessed by the roots. How can they truly thrive under these conditions. Humans are the same way structured with all those years of imprisoning left-brain education. How can anyone thrive under those sorts of conditions. The many have come to "believe" that surviving is thriving and that lie continues the legacy of pain and suffering. I am reminded of a teaching from spirit through my art, in particular one piece I drew with nupastels back in 2001. What is intriguing about doing art, is you get to a point where you let go and allow the creative muse within express itself through you and it begins to present some amazing things. I love that word amazing; amazing grace is what flows out of us when we let go and there's a never ending flow from our divine parents. 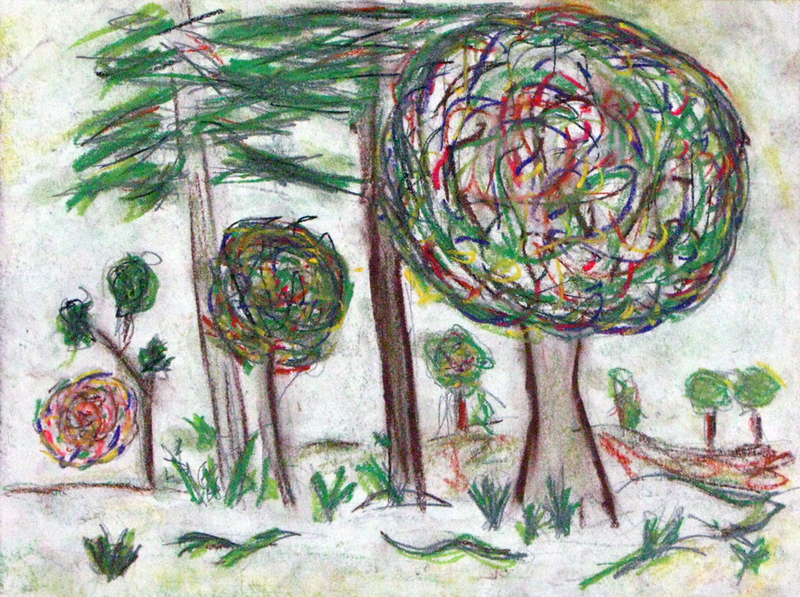 I finally understood what the message was a couple of months ago about the drawing of the trees and the ball of energy. The tree is the human form, our vehicle for this particular incarnation. The ball of energy represents our spirit as consciousness, able to move about at will unencumbered by matter. Notice in the image the smallest tree to the left with the energy form near the tree form. As you move right there are two other trees, each showing the spirit more integrated with the tree form. If you cut the tree down, or traumatize the form, at some point the spirit looses its structural integration and moves away in order to allow the form to re-orient itself. In this particular case, childhood is representative of numerous traumas that force the form into dysfunctional molds that bury the authentic expression of true Being. The way out of this imprisonment is to remove the iron grates and begin to dig up all those silly bricks to take apart the rigid structures of thoughts that have been chained into beliefs. Why go through all that trouble you might ask? Because underneath all that human made constructs is your spiritual nature patiently waiting for you to let go of the pain and suffering to behold your magnificent divine essence. There is no original sin, nor anything you need do except let go of the ball and chains you've been dragging around because someone forced you to do it as a small child who had no choice but to obey. When you get rid of the grates, bricks and concrete, the soil will begin to birth Nature and at some point a seedling will magically appear and begin to grow the tree back to its full stature. Why do you think there are so few ancient trees left in the world, or for that matter some decent older ones within the urban areas? All that Nature stuff will wake people up and its why the many have been forced and wooed off the lands to live in the cities and suburbs, to wean them off of Nature so they lose touch with their own inner nature. The forces of Nature will heal you and awaken the dormant seeds of spirit within you. Everything in Nature is a reflection of our inner Nature. Look at Nature and the destruction of the habitats of the other life forms and beings along with the toxic pollutants and extinctions that continue on unabated. They are all a reflection of our own inner Nature being destroyed. When there is no more wildness, there will be no more wildness/spirit in human beings. Instead they will become human doings. The signs of becoming robots have been with us for quite awhile and will only worsen as time goes on. Pain and suffering will continue to rise in order to get your attention to what you are not aware of. Pain and suffering are there to tell you what is not working. If you pay attention and listen, the answers are right there within you in the silence you avoid in the daily trek of past and future tripping. The trek of fear is an endless journey with no end in sight unless you begin to love. The trek of judgments is an endless journey with no end in sight unless you stop judging. The trek of thinking is an endless journey with no end in sight unless you find the present. The circle is infinite, but the finite aspect of it is its endlessness, never ending cycle of falling from grace, or rather incarnating into matter and falling asleep and forgetting who and what you are until the pain and suffering of forgetting and getting lost becomes so great that one begins to remember and finds their wings and returns to the garden within. Getting lost is an act of being drawn away from your inner awareness. How much longer you live in pain and suffering is up to you. There is no other who can take the pain and suffering away except you. No person, place, or thing will remove it and you know this to be true. What you have given up for the rewards of the modern world is the greatest con job that has ever been pulled off. How much is your awareness worth? How much is your dignity worth? How much is your self-love worth? How much is your self-respect worth? How much is your self-acceptance worth? Is fear, guilt, and shame worth giving all those up? How about money, prestige, and material things? What is it worth to kill someone or hate someone or judge someone? What value does one get to mock, harass, or inflict pain and suffering on others? Evidently there is some value as the many are caught up in this quagmire born of self-loathing and self-hatred. What's the value? When you begin the journey to figure it out, you will begin to cut the ties that bind you and along the way you will be re-united with your authentic self. One might perceive they are losing everything, but in reality they are gaining everything. The illusion will kick and scream as you drag it towards the full truth in the present. And when the closer you get the harder it will fight, but keep on going, as it will eventually fall away to reveal what has always been so close and near to your heart. And don't look back once you get there, as there's nothing worth looking back for. It's like climbing a mountain face and having the urge to look down. Don't look down, keep climbing and eventually you reach the summit. Asking for directions from the lost will only get you more lost. You know the way home, its embedded in your being and is always broadcasting the way. Just listen and you will begin to know. There's no special book to read, just look within and listen to the amazing grace within. There is no salvation in some after life. That is the biggest lie that religion has propagated to get you to stop seeking your authentic self. There is only right now in the present and that is where the divine is to be found. Our divine parents are not outside us or far, far away in some distant galaxy. They are here within each of us and I know because I experience their presence on a daily basis. I didn't find them in a book or in a church or in past tripping or future tripping. They didn't appear because I was good enough or rich enough or because I had the right label or ism. The moment I started to let go of my pre-conceived ideas and limiting beliefs and began to spend less time past and future tripping, their spiritual presence began to show up. How can anyone experience their direct presence, when they are not present to experience it? The only thing past/future tripping humans can experience is the endless repetitive mantras of beliefs and patterns that shackle them to the mundane materialistic mentality of conformity. In this mode of conformity, the only presence one experiences is that of fear and limitation. The only voices you hear are those that repeat the same fear, guilt, and shame tactics that continue to judge yourself and others guaranteeing the continued imprisonment of your authentic self. What one needs to do is listen to the whispers in the light. Whispers in the light is a metaphor gifted to me by spirit in a poem called Music At The Stairs. I was leaving college at the end of the day, heading for the exit doors, when I heard the most beautiful sounds coming from the stairwell. Someone was playing a flute and another a didgeridoo with such heartfelt expressions from above that I was literally moved to the stairs by the music. I sat down, pulled out my journal and the words just flowed out within minutes. The gift is already given within you if you will but accept it. This is what self-acceptance is; receiving the divine gift of awareness, of unconditional love. There is nothing you need do except let go and accept. The only way to accept this ongoing gift of flowing grace is to stop judging yourself and others. This is a very challenging quest to begin. But, the challenge is simple in that the judging is not your authentic self. Over time you begin to just notice the ongoing chatter. Your only task is to not react. When you do, simply step away from that which is reacting. Stop identifying with it as it is not your authentic self. Eventually you will become aware of a separation that will reveal the judging to be separate from your observer self. There is no need to cling to anything, no need to identify with any person, place, thing, or belief, as they have no bearing on your authentic being. Self-acceptance is simply accepting your authentic self without judgments of any kind. When you do this often enough, the judging will eventually cease to exist. This is what self-love is; complete acceptance of your authentic self. Self-acceptance leads to self-love and this is what self-respect truly is. When one respects themselves they are in a state of non-judgment about themselves and hence others. Therefore respect is not something you do, it is something you are. Your authentic presence arises from self-respect. Respect doesn't come from anyone or anything outside of yourself. It cannot be given to you by another as you have to give it to yourself. The act of letting go is the giving into acceptance, is the blessing, the acceptance of your holiness, your wholeness, your at-one-ment, your joining with the divine presence of all that is authentic within your existence, and all of existence as well. In this moment you are enough. This fulfillment is your gift, your enoughness presents itself when you enter into the divine union, which is what the present now is. At first it will feel odd, as it is out of character for one to be present in the ongoing bus-i-ness of a world gone mad in pursuit of past/future non-sense. One is undoing years of avoiding their authentic self, so it will feel different. But repeated experiencing of this state of grace will bring remembrance and suddenly you will realize the preciousness of the gift. You will permanently embrace the experience now and forever more. At some point one realizes the price paid and understands from experience how more enjoyable Being is. There is nothing worth more than this. "I think that it is mostly in the solitude of the night or at dawn that one can feel one's belonging to God, to nature, to the universe and to eternity. Once involved in the daily world of objects, noises, claims and obligations, one is diminished, reduced, dragged down by the agitated world, unless one takes refuge in nature. We must be concerned that with diminishing nature humanity's psyche might deteriorate as we go into the next millennium. Ecologists should therefore not only study how other species can be saved in natural parks. They should also study the effects on humanity of a diminishing nature." The realizations and awareness have been like a non-stop tsunami wave and all I can do is just let go, as its the only thing to do. Accepting what is as it arrives/arises is as good as it gets. Judging it surely is a complete waste of time, as it just creates this delusion to avoid what is. Of escaping in the head to create some dysfunctional fantasy for the sake of appeasing the masses. I was reading over the first entry for this month and noticed I'd forgotten to add in an additional piece, so wrote it in. But, I will address it again here. The issue was with how one reacts to another person(s) judgments of them. If one reacts, then assuredly it is the personas, masks, and facades that trigger a reaction, to play the game of "there's something wrong with me that I have to defend by taking it personally." As Bill The Cat would say, ACK! Did it ever occur to you that those doing the judging and condemning you from behind their own personas, masks, and facades? If they weren't, there would be no judgments forthcoming towards you because they would not be judging themselves. They judge you because they judge themselves. This bears repeating, because the many are so caught up in this dysfunction, they are unable to see it. And, even if they were to read these words, they would intellectualize it and agree with it, but then go on about their daily lives oblivious to the onslaught of inner judgments by ego. How is this possible you might ask? Do you really need to ask? Observe and the truth of the matter will reveal itself quite readily. What is it that resists finding this truth out? The truth wants to be known, for that is what truth is; known. By known, I don't use it in the context of intellectual knowing, but in the context of truth that needs to defending, needs no scientifically agreed upon census or a majority of people to say it is so or not so. Truth comes into view, into awareness without effort or struggle or judgment or "reason." Truth is acceptance of what is without personas, masks, or walls. Personas, masks, and walls are necessary for half-truths or out right lies to exist. The many have become believers of non-sense that has been woven into intricate structures of distorted information that has created the illusion of right and wrong based on beliefs that support the personas, masks, and walls for those who go against their own authenticity for greed or power or desires or the need to control. This is the only reason they exist, to support a delusional reality for short term gratification at the expense of others. Ironically, the price they pay for their denial is as great as those who suffer at their hands. They just don't have the awareness to feel the price. Their personas, masks, and walls prevent them from self-reflection of their acts and deeds. In the moment you begin to set aside the personas, masks, and facades, you begin to set in motion the process of freeing yourself from the power others have over you. A person has to have their own self-approval, self-acceptance, self-worth, self-love, and self-respect, in that order, for them to be enough, other wise one is always seeking it from others. To deny this fact is to deny your authentic self. The irony of this whole life time is there was nothing wrong with your authentic self when I was born. You had to go along with the program as a child; there was no choice. You are no longer a helpless child, nor are you an adult who requires others approval either, because when you really assess what I've said, you will recognize that nobody can ever give you your self-approval. It doesn't matter if 100,000 people approve of you, for it comes down to your self-acceptance. If you are doing nothing to harm others, then others judgments have no value other than to control you to make sure you do not find your way back to your spiritual home within. You have to agree to take the "others" judgments personally in order for them to affect you. If you make it your business to take it personally, then you have agreed to give your authentic power away. When you react in any way or form to their judgments, their insanity, you are agreeing to play the same game. Because they also have others who judge them as well. It is a never ending story of insanity of judging to the Nth degree. The reasoning mind; the dog chasing its tail. There's no end to the pain and suffering that arises from judging. Has it occurred to you to ask yourself why you take things personally? When someone judges you, they are wanting to avoid looking at something within themselves. Period. The judgment is the weakness. Just notice how you feel when being judged. Follow that feeling within and look around. Ask yourself when you felt that way as a child. Use those feelings that are triggered to take apart the personas, masks, and walls. Don't judge the feelings either, for they are just arising to point the way home. I know this may sound ridiculous, but I can assure you if you follow those bread crumbs, you will uncover the truths within you that will melt away all that delusion that maintains the personas, masks, and walls. It's like waking up from a dream and the dream still has you in its grasp and you're believing it to be real, until you awaken fully. An example of this occurred 15 years ago when I was dreaming I had stolen a Seattle Metro bus and drove all around town. I finally parked it over on a side street near where I was lived. I woke up from the dream, and was so caught up in it as real that I started freaking out about getting caught. After a few minutes off getting more awake and walking around my room, I realized it was just a dream. But, in those few minutes it was so real. This is what we are waking up to, how we react, how our mind engages specific patterns of reaction that are culturally accepted norms that we have agreed to as "normal." Normal is what the norms are. This idea of norms is so polluted with dysfunction that we don't know what normal is anymore, because authentic self is constantly being avoided by reactions and distractions. Reactions and distractions are the fodder for past and future tripping. Get rid of the reactions and distractions and you've just found the portal out of the delusions. Part of the problem of choice, is most don't know there are choices. The game has you so caught up in fear, guilt, and shame, that you're endlessly reacting to the judgments unaware that there are other choices. How can one make an informed choice without all the facts? If you reduce the reactions and distractions, you begin to have awareness of other possibilities. When you come back to authentic awareness to express the divine being you were created to be, you begin to remember what you are truly capable of creating from the vastness of divinity within you. When a person has all the facts, only then can they make an informed choice. Until then, one is merely a puppet with someone else pulling your strings. The strings are representations of the lesser mind constantly reacting and distracting you from the open doorway within. The choice cannot be made until you decide that your self-acceptance is more important than having the acceptance of others. One cannot make an authentic choice until they stop trying to chase after the carrot dangling over their head in front of them. You'll never get the reward because the game is rigged by having you believe that some other person, place, or thing has greater value than yourself. There is no carrot unless you agree there is one. Why would you agree to one? You want something. How much is it worth? More than your self-worth? How much fear, guilt, and shame is worth swallowing to get something? Everything has a price. The trick is knowing the price and knowing what one's limits are. Some things are priceless and are not for sale. Your authentic self, authentic Being is priceless. It's time to begin the process of reclaiming what's yours to embrace once again.